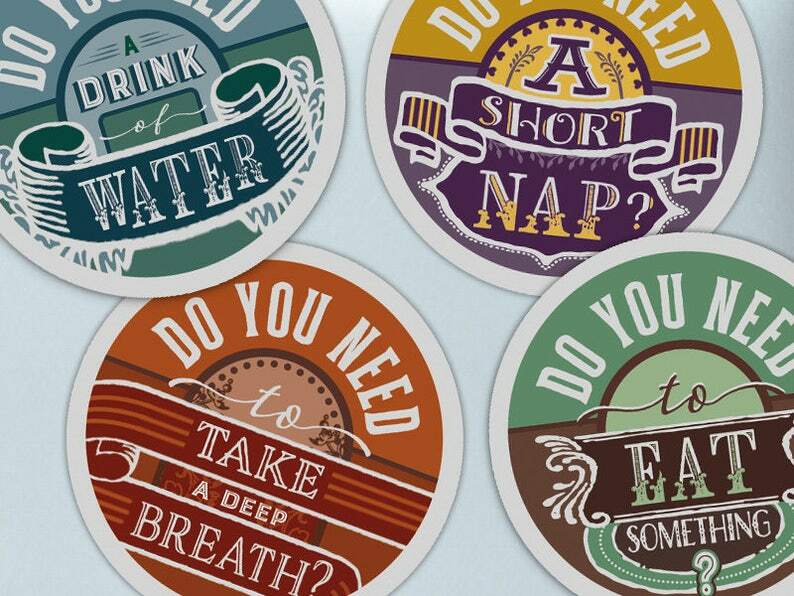 A sheet of four colorful little stickers, featuring reminders to eat food, drink water, nap, and breathe. Let these cuties remind you to take care of yourself, to be gentle with yourself, to endure. Inspired by Victorian graphic design, these stickers join the rest of our collection to form a coalition of caring. Strength, resilience, and adulthood are built upon a steady foundation. Let them be a part of your environment as you resist and persist, because it's easier to fight when you take care of yourself, and it's easier to take care of yourself when there's always something there to remind you. Modern Graphic Design. Historical Inspiration. Delivery times estimated and not guaranteed. Please order early if you need it by a certain date. Expedited shipping available. Due to the vagaries of computing, the color you see on your screen may be slightly different from the final product. They are great but they are SUPER TINY! I put them on my computer and I love them. Smaller than I thought, but super cute and good quality!